The system checks for any variation in the volume in the passenger compartment. The alarm is triggered if anyone breaks a window, enters the passenger compartment or moves inside the vehicle. The system checks for the putting out of service of its components. 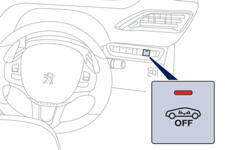 The alarm is triggered if the battery, the central control or the wires of the siren are put out of service or damaged. For all work on the alarm system, contact a PEUGEOT dealer or a qualified workshop.